Lightweight, long-distance, off-trail hiking and packrafting in Alaska. We've traveled over 6000 miles in the Alaska wilderness (as well as another thousand or so in Washington and British Columbia) - from Southwest to Southeast , the Brooks Range, and many spots in South Central and the Kenai Peninsula. 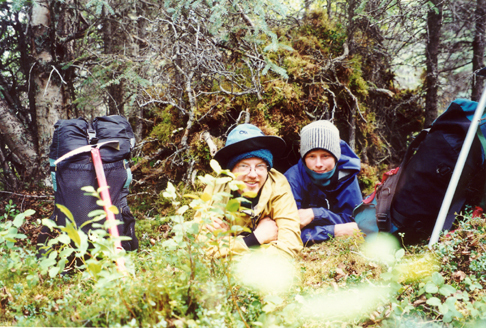 You can find stories, journal entries, maps and pictures of our adventures in the Alaska treks section. For the latest happenings, visit the blog on our new website: Ground Truth Trekking. Ground Truth Trekking seeks to increase awareness of natural resource and environmental issues by providing information, photos, and stories about the places at the center of these issues. Our Journey on the Wild Coast was an unprecedented four-thousand-mile expedition along the northern edge of the Pacific, through some of the most rugged terrain in the world. We traveled from Seattle to the Aleutian Islands. From the Puget Sound to the Bering Sea, along the edge of the north Pacific. Entirely under human power, by foot, packraft, and skis. An expedition to explore and communicate the broad environmental issues facing this region. June 9, 2007 through June 27, 2008. Looking for my Pebble Mine page? Alpacka and Sevylor reviews, packrafting tips, and packraft trips. Photos and info about a proposed gold/copper mine in the heawaters of Bristol Bay. Links to other backpacking pages, gear manufacturers, etc..
A guestbook for comments, questions, or ideas. If you're planning your own trip, you can find our ideas on trekking gear and pack food. Our style of wilderness travel is a bit idiosyncratic, so take any advice here at your own risk. Hopefully, some folks reading this page will be inspired to undertake their own bizarre adventures.